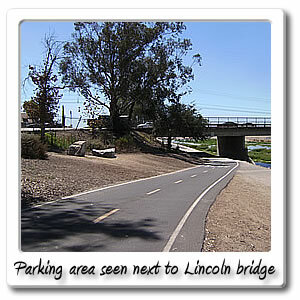 Welcome to Lincoln Avenue on the Santa Ana River bicycle trail. 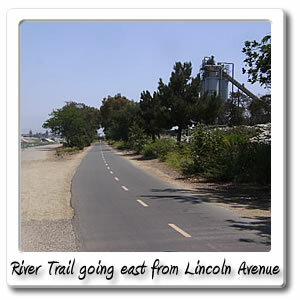 Just before the 16 Mile Marker on the Santa Ana River Trail, you can find the Lincoln Avenue entry point on the Santa Ana River Trail, after about an hour and 19 minutes of riding 15.7 miles from the beach. 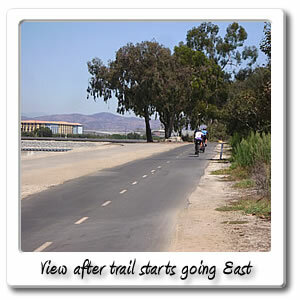 At this point you are more than half way through the Santa Ana River Trail, if ending at Green River Road in the City of Corona. You have 13.1 miles and another hour and 2 minutes to go. 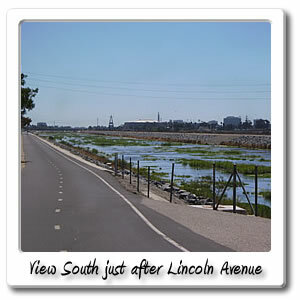 If exiting the Santa Ana River Trail, and going west through the City of Anaheim for .2 miles and 1 minute you'll be right by Anaheim Coves Trail which is 14 acres surrounded by the 125 acre Burris Basin and 2.4 acre island, for nesting above the water. 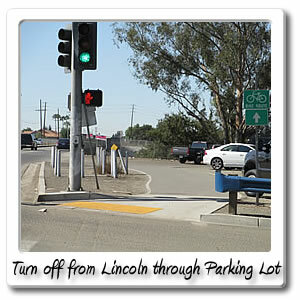 If you continue west on Lincoln Avenue for .4 miles, for two minutes, will be a Del Taco, Liquor store, and bar, and other shops at Rio Vista Street in the City of Anaheim. Across the street from that is a Carl's Jr. and other shops. 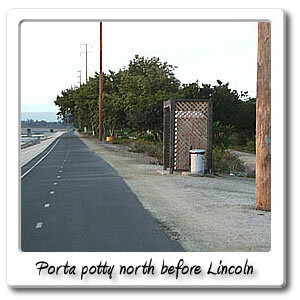 Then across from that is 7-11 and Mexican food and a couple other things. 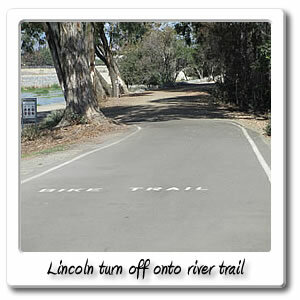 If exiting the Santa Ana River Trail, and going east through the City of Orange, you will have to go for .3 miles for 3 minutes before you will reach a liquor store, other than that you have to go another .3 miles and for another minute or two and reach Glassell Street, where there will be a Winerschnitzel, then a liquor store and deli across the street from that. 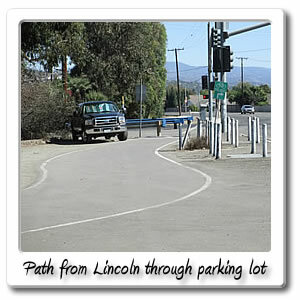 If you go east on Lincoln Avenue after getting off the Santa Ana River Trail, you will find the Village of Orange, in the City of Orange. 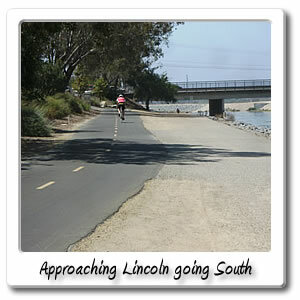 You can find a Wal-Mart and other department stores and shops, and several places to eat all up and down Tustin Avenue, when it intersects with Lincoln Avenue 1.6 miles and 11 minutes after getting off the Santa Ana River Trail. There you will find a Denny's and liquor store, just before that is a Del Taco, Subway. 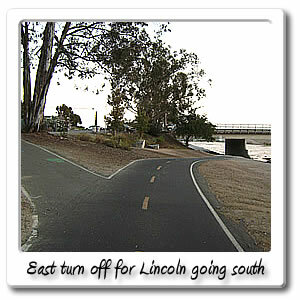 If you turn left once you get to the intersection of Tustin Street and Lincoln Avenue you will have to go south on Tustin Street for .4 miles before you reach the Village at Orange in the City of Orange, after going a total distance of 2 miles after getting off the Santa Ana River Trail.